There are many species of deer in the United States. The most common and widely distributed is the Whitetail. Though their numbers dwindled in the late 19th century, wildlife management, limited hunting seasons and a reduction of their natural predators have enabled populations to rebound. In fact, several states boast populations of deer in excess of 1 million. Though hunters, cars and disease take their toll annually, whitetail deer continue to prosper and are now a pest in several areas of the country. This article will explain how you can stop them from entering your yard and eating your plants. Whitetail deer present a problem when food sources are limited and browsing of local herds begin to damage plant life. 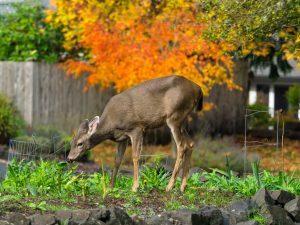 Deer forage for food where it is most plentiful and nutritious. 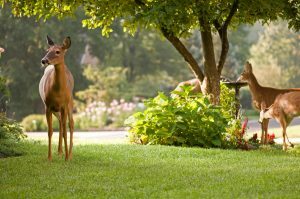 Their diet includes all types of browse (leaves, stems and buds of woody plants) as well as flowers, grain, fruit, vegetables and just about anything a homeowner might plant around the yard. Deer eat a lot; the average adult male can consume over 5 lbs of food a day. Deer populations have outgrown many areas forcing them to find food where available. Many times this leads them to peoples yards. Deer can do a lot of damage in a very short period of time. Expect to find gardens invaded during the night and plants eaten to the ground. Flowers simply disappear and fruit bearing vines will have no fruit. Though you can complain to your local animal control office, there is generally nothing that can be done since this large animal is protected and very difficult to live trap and relocate. Occasionally deer have to be tranquilized and taken away, but this is the exception and not the rule. 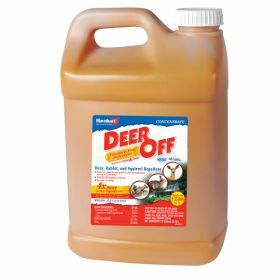 If you have deer actively eating plants, DEER OFF is a proven repellent when applied to targeted plants. It’s concentrated and when mixed with water, treated plants will become “bad” tasting so foraging animals like deer or rabbit will avoid the protected plants. 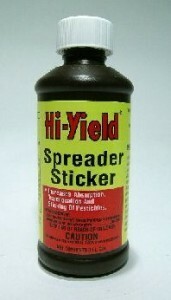 Add just 1 oz of Spreader Sticker per gallon of mixed Deer Off. TO INSURE YOU GET THE BEST RESULTS AND TO MINIMIZE THE RISK OF PLANT BURN, TREAT WITH DEER OFF AND SPREADER STICKER IN THE EVENING JUST BEFORE DARK. Remember, you don’t want to spray fruit or vegetable yielding buds. you intend on eating. The bad taste will make the harvest useless. You may spray the plant stems, stalks and leaves as the plant develops without the taste getting to the fruit. This could prove a big help when dealing with deer that like to eat young plants that haven’t produced any crop yet. Be sure to treat these to insure they can. 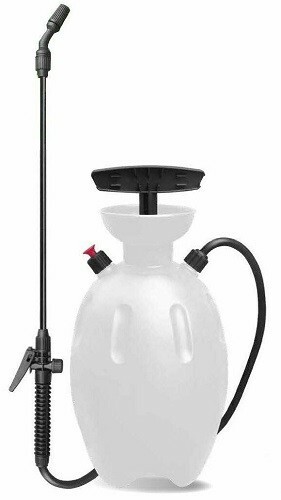 To make the treatments, use any standard PUMP SPRAYER. 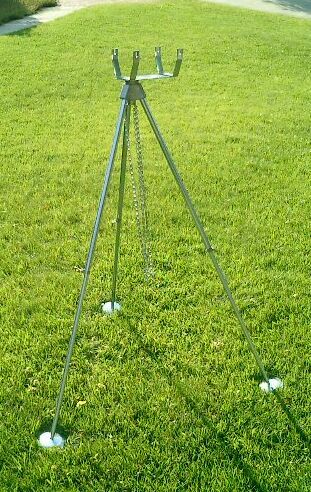 A simple “scare” device to chase away deer is the MOTION ACTIVATED WATER SPRAYER. It uses nothing but water to chase pests and can be quite effective when trying to protect small areas from foraging deer. 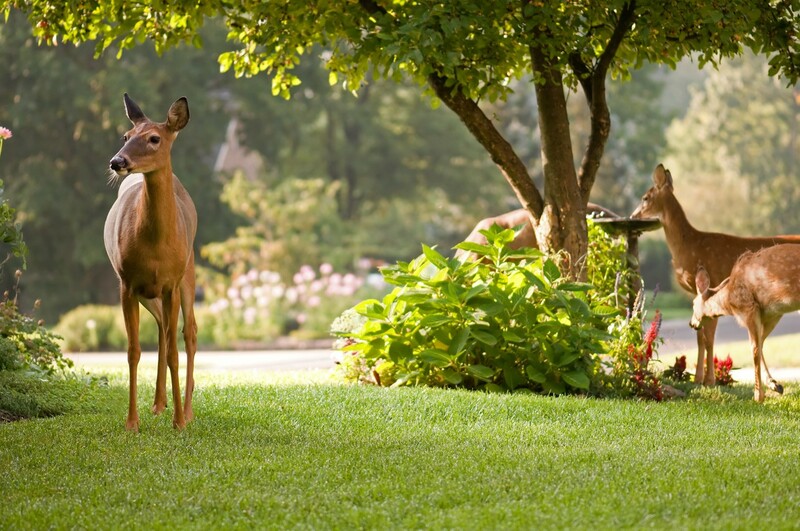 Lastly, one of the easiest ways to keep deer from entering your yard is to install SOUND REPELLERS aimed along property borders, routes of entry and the plants they target. For open areas, it will protect up to 5,000 sq/ft. 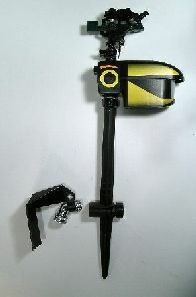 Like a flashlight, the sound will project in the direction the unit is pointed. Our unit can be set to operate at night, day or both. 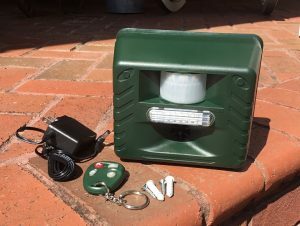 For deer, you’ll want to set it for “night”. Next, you’ll want to set the audible sound as high as you can. In general, 60-80 is high enough. The LED Light Bar will go off automatically as will the Ultra Sound. The audible sound does not need to be on but for deer, keeping it active and turned up high is best. Lastly, turn the yellow button frequency setting almost all the way to the left pointing at the word “deer”. For really persistent deer abundant over an acre or more of land, go with an ANIMAL CANNON. This loud “sonic” boom of a sound is enough to spook any deer and they won’t get used to it. 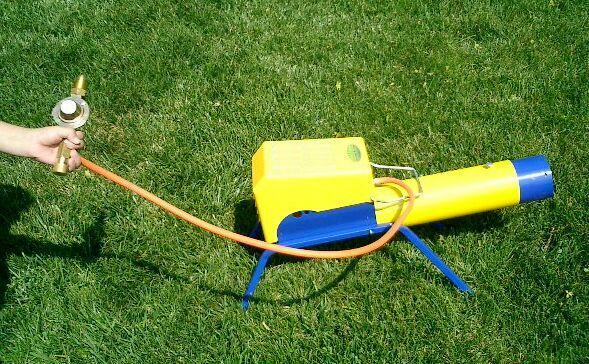 Small yet powerful, this device uses propane to power itself and doesn’t need much maintenance. Basically you hook up a standard barbecue propane tank to the unit and when it fills with pressure, it will release. The time between sounds can range from a few minutes to 10 or more when the tank gets low and the pressure drops. But tanks can last several months so it will not cost much to power one for a year. 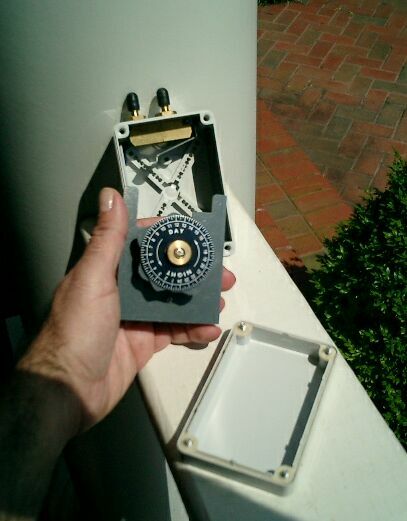 Just set it up and point it in the direction you want protected and turn it on. Blasts will keep the area free of deer for sure.